PORTABLE TRUCK MOUNTED LIGHT TOWERS REMOTE CONTROL from within vehicle cabs. Driver will be able to start and stop generator, pivot and telescope light tower while turning on floodlights all within the cab of vehicle. 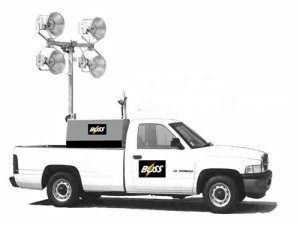 Truck mounted light towers can be designed to fit within the larger long-bed pick-up trucks, on stake body beds and attach to utility type trailers. 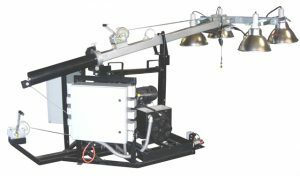 The floodlights supplied with truck mounted light towers have special spring supported fixtures. This is a perfect light tower for Border patrol agents, US Marshals, FBI, State Police, Wildlife and Fisheries, Local Sheriff and City police. Used for check stations, search and rescue, man-hunts, and for emergency response for wilderness policing actions. Boss offers the floodlights with LED, Metal Halide or High Pressure Sodium Floodlights. The LED lights are good for Check Points and smaller illumination requirements. For massive amounts of floodlighting over larger areas Boss recommends the Metal Halide Floodlights. For heavy ice fog burdened areas Boss will recommend the High Pressure Sodium. The floodlights come with both Spot projection and Floodlight control. For projecting a beam of light over 300′ Boss only recommends Metal Halide Floodlights.